Healthy seeds and propagules are the basic requirement for producing good grains, fruits and vegetables needed for human survival and perpetuation. Dispersal of microbial plant pathogens via seeds and propagules has assumed more importance than other modes of dispersal, as infected seeds and propagules have the potential to become the primary sources of carrying pathogen inoculum for subsequent crops. Several diseases transmitted through seeds and propagules have been shown to have the potential to damage economies as a result of huge quantitative and qualitative losses in numerous crops. Hence, it is essential to rapidly detect, identify and differentiate the microbial plant pathogens present in seeds and propagules precisely and reliably, using sensitive techniques. Microbial Plant Pathogens: Detection and Management in Seeds and Propagules provides a comprehensive resource on seed–borne and propagule–borne pathogens. Information on the biology of microbial pathogens, including genetic diversity, infection process and survival mechanisms of pathogens and epidemiology of diseases caused by them, are discussed critically and in detail to highlight weak links in the life cycles of the pathogens. Development of effective disease management systems, based on the principles of exclusion and eradication of pathogens and immunization of crop plants to enhance the levels of resistance of cultivars to diseases, has been effective to keep the pathogens at bay. The need for production of disease–free seeds/propagules has been emphasized to prevent the carryover of the inoculum to the next crop or introduction of the pathogens to other locations. Effectiveness of adopting simple cultural practices and development of cultivars resistant to diseases through traditional breeding methods or biotechnological approach have resulted in reducing the pathogen inoculum and disease incidence. Although application of different chemicals may reduce the disease incidence effectively, biological management of crop diseases, employing potential biological control agents have to be preferred to preserve the agroecosystems. Greater efforts have to be made to integrate compatible strategies to enhance the effectiveness of diseases management systems. Protocols appended at the end of relevant chapters form a unique feature of this book to enable the researchers to fine–tune their projects. 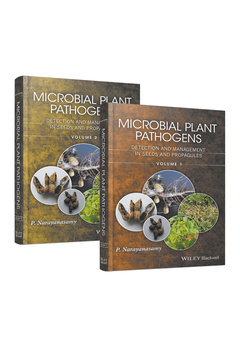 This 2 volume set provides comprehensive and updated information about the economically–important groups of microbial plant pathogens carried by seed and propagules. Graduate students, researchers and teachers of plant pathology, plant protection, microbiology, plant breeding and genetics, agriculture and horticulture, as well as certification and quarantine personnel will find the information presented in this book useful.